YETI Hopper Backflip vs RTIC Backpack Cooler – Which is the Best Backpack Cooler? 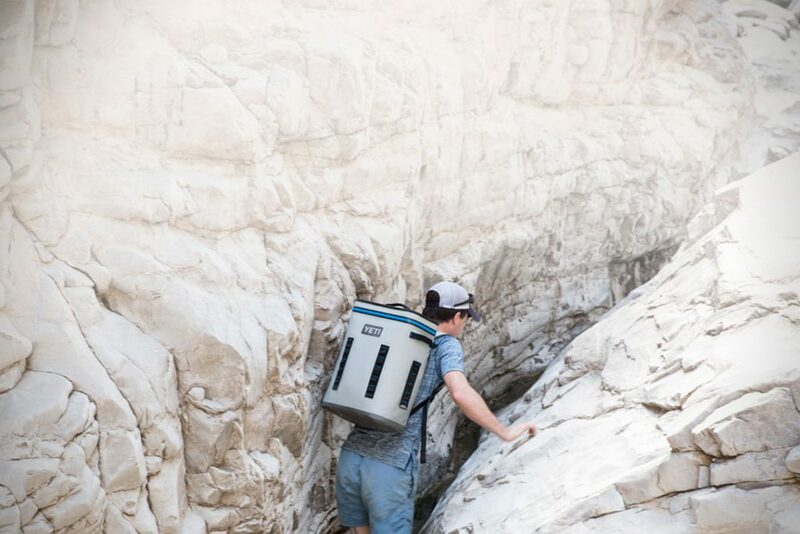 If you are checking out the best backpack coolers, the first comparison should be the YETI Hopper Backflip vs RTIC Backpack Cooler. These are two of the top models around, making them exceptional options to choose from. With so many backpack coolers available, you may have difficulty figuring out which are the best models to meet your needs. Before you bury yourself in a mountain of options, it’s best to start with a couple of the best brands. And the top names out there to compare first are the YETI Hopper Backflip vs RTIC Backpack Cooler. The RTIC soft backpack cooler was just launched, while the YETI Hopper Backflip backpack cooler is being released Spring 2018. Both are the only backpack options carried by either company but have the features that prove they are worthy of the RTIC and YETI names. If you’ve been wondering how to compare the YETI Hopper Backflip vs RTIC Backpack cooler, check out the differences between the two that we’ve researched, and how they compare in terms of durability, performance, and price. Then you can decide for yourself which one is the best backpack cooler for you. 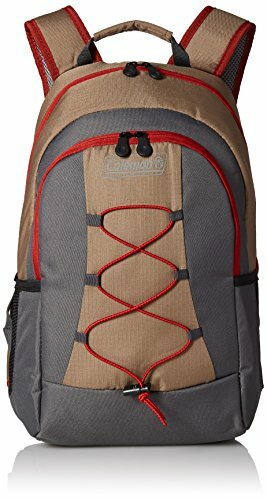 YETI Backflip vs RTIC Backpack Cooler: What is the Top Backpack Cooler? If you’re traveling for the day or the weekend, you’re going to need to carry all the food and drinks you’ll need for the entire trip with you. If you try to carry a big rotomolded cooler or even a smaller soft cooler, you’re going to need at least one hand on the cooler itself, limiting the number of other belongings you can carry. Having a decent backpack cooler can keep your hands free for your other gear, be it a beach bag, surfboard, or your fishing rod and tackle. But you can’t just strap any old backpack cooler to your back. You need to make sure it has decent features to give you the performance you need. Good insulation and materials are most important, to keep the bag intact and retaining that ice for as long as possible. Waterproofing is also a must, so that melting ice doesn’t soak you while you walk. Adjustable straps with sternum and waist belts are good to have, so you have the right fit and support. Multiple pockets can be handy to hold your other essentials. These are the most important features to look for, with any extras being a bonus. YETI Coolers was founded in 2006, by two brothers who loved everything outdoors. After years of dealing with inferior coolers that didn’t meet their expectations, they decided to build their own. They wanted a cooler that would last through even the most rugged outdoor adventures. Today, YETI has a variety of hard and soft shell coolers available, all with great features and nearly untouchable performance. 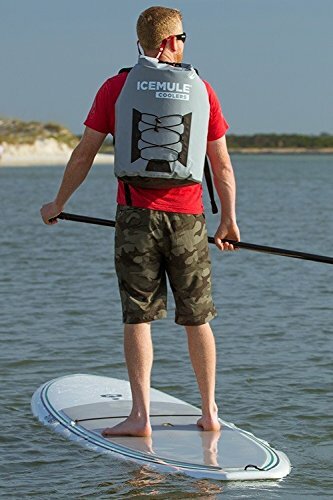 And now, in 2018, they have released their very first backpack cooler, the YETI Hopper Backflip 24. Since the YETI Backflip isn’t actually for sale just yet, its performance hasn’t been tested by the public. The company boasts that the “ColdCell Insulation offers far superior cold holding than ordinary soft coolers”, but until it is out in the hottest temperatures summer has to offer, we’ll have to take their word on it. When you look at the YETI Hopper Backflip vs RTIC Backpack cooler, you’ll notice that the Yeti backpack cooler has the same lack of pockets found on the RTIC model. Aside from the large main storage compartment, there is no enclosed storage of any kind. If you are carrying any smaller items, such as a phone, GPS, wallet, or keys, you’ll need to fill the pockets of your clothing or use another bag to hold them all. This is one area where the YETI Hopper Backflip 24 doesn’t match up to other brands. The main compartment holds up to 20 cans of beer or 25 lbs of ice, so it should carry enough to last you at least a couple of days. The Yeti Hopper Backflip has ergonomic shoulder straps to make carrying it as comfortable as possible. Like the RTIC backpack cooler, these straps are adjustable. The YETI Backflip also has a chest strap and a waist belt, like the RTIC. The difference between the YETI Hopper Backflip vs RTIC Backpack cooler is that these extra straps on the YETI model are removable. You’ll know as soon as you put the backpack on if you need the extra support, so can take them off and leave them at home and out of the way when they are of no use. 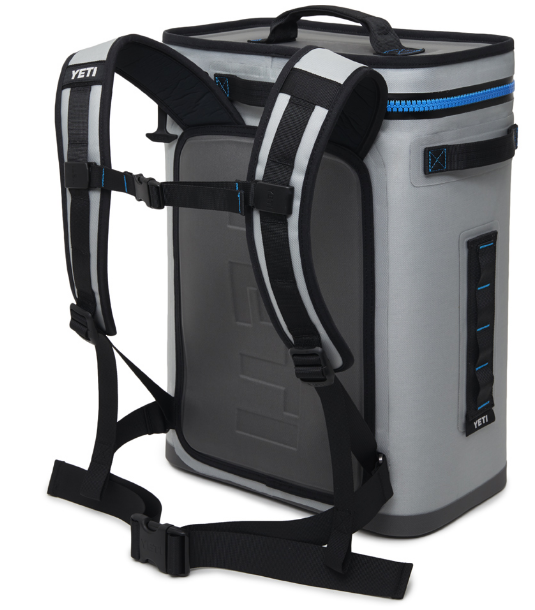 The YETI backpack cooler also has two side handles and a top handle, making it easy to carry it in any situation. The outer shell is made using the Hopper’s high-density Dryhide material. This is waterproof and resistant to mildew. This material also resists damage from punctures and UV rays. The YETI model uses a Hydrolok zipper, while the RTIC backpack cooler opts for a roll-top closure. This zipper is also water and leak proof, like the fabric. Once again, though, since none of these features have been tested by the public, we’ll have to wait and see if they meet the claims of the company. Since the YETI backflip has no pockets, they had to add another way to carry your extra gear. To meet these needs, they have added four Hitchpoint Grids to their backpack cooler. There are two on the front and one each on the side. This is essentially a series of daisy chains, giving the room to hook almost anything to the backpack for easy access and carrying. RTIC’s slogan is “Over Built – Not Over Priced”, and this comparison seems to be directed at YETI Coolers. In fact, if you look at similar models of coolers made by these two, RTIC’s coolers are at least half the cost of any YETI cooler available. Unfortunately, RTIC was recently sued by YETI, on the grounds of Patent Infringement, Unfair Competition, and Trade Dress Infringement. But early 2017, a settlement was reached, and after redesigning many of their products, RTIC is back in business, with new looks and the same low prices. The RTIC backpack cooler is made to last, with welded seams, no zippers, and a roll-top that seals tight with buckles that keep it from opening during your travels. Not only does this keep leaking to a minimum, when you compare the YETI Hopper Backflip vs RTIC Backpack Cooler, there is one main advantage to the RTIC model. These features work together to not only hold any melting water in, it also holds in the air in the bag. This allows it to float if the backpack falls overboard while you’re fishing or boating, making it easier to find it again and reducing the risk of losing the bag and everything in it. This also helps to retain the ice inside for longer. 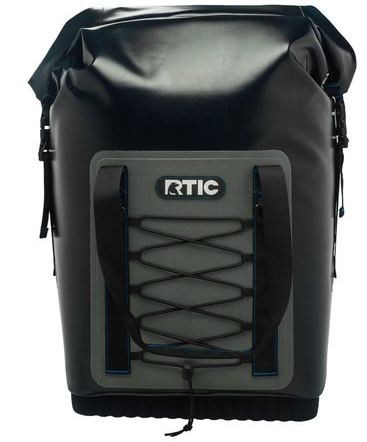 Like the YETI backpack cooler, the RTIC model has no pockets to speak of. This is a bit of a flaw since you always have a few extras to carry that you probably won’t want to stuff in the main compartment where they could be soaked. The main compartment is larger than the YETI Backflip, holding double the cans. 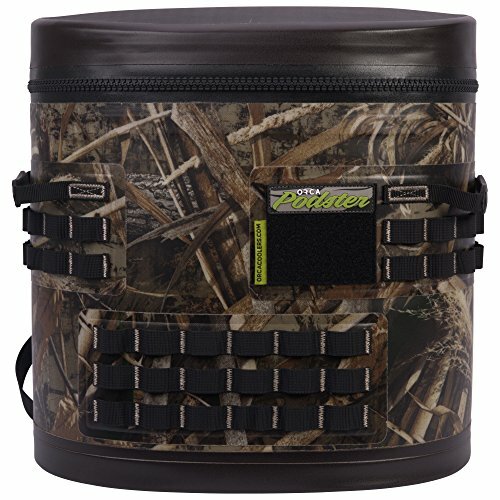 In fact, the RTIC Backpack Cooler holds up to 35 quarts, so you’ll have more than enough room for food and drinks for you and a couple friends for the weekend. When you look at the YETI Hopper Backflip vs RTIC Backpack Cooler, you’ll notice they have similar straps. The RTIC’s are padded for comfort and adjustable for the right fit. This one also has a chest strap and a waist belt, though the sides of the waist belt are wider and padded as well. But the chest and waist pieces are fixed rather than removable. Though it lacks the side handles you’ll find on the Yeti backpack cooler, there are carry handles on the top. They have a padded Velcro connector to hold them together, which also helps seal the roll-top for added security. The exterior of the RTIC Backpack Cooler is made of durable laminated nylon, which not only resists punctures but also holds up against harsh weather conditions. To help retain that ice is premium insulation for all-day ice retention, even on the hottest days. Instead of pockets, there is an elasticized rubber cord on the front of the bag, which can hold some gear. A couple metal loops are also found here to attach carabiners to hold even more of your stuff. And unlike the YETI Hopper Backflip 24, this one comes in two colors, grey and camo. Another handy feature you won’t find on too many other backpack coolers is the ability to roll up the bag when you’re not using it. This gives you a much smaller package to store. The ORCA Backpack Cooler is both water and leak proof, with SPEC-OPS 840D double TPU material on the outside and SPEC-OPS 210D double TPU inside, which is both FDA food grade, anti-microbial, and free of BPA’s. There is META-POLYMER closed cell foam insulation in the walls, with EVA reinforcements in the lid, back, and base for a sturdier cooler. The zipper is also waterproof and the seams are welded for a drier backpack. This model weighs 3.6 lbs and has the capacity to carry 7.5 lbs of ice with up to 12 cans of beer or soda. 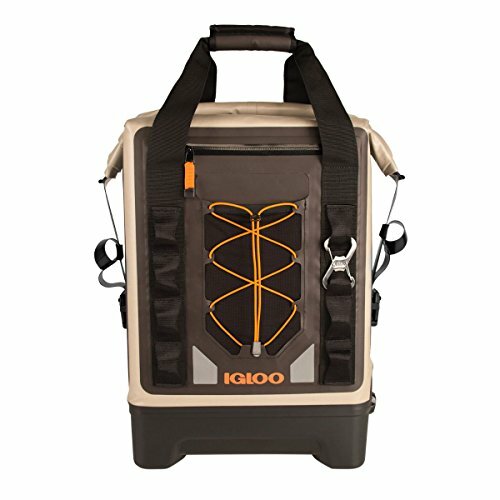 The Igloo Sportsman Backpack Cooler uses waterproof nylon with welded seams to keep the ice water in and the elements out. There is ultra-thick insulation to give you up to 2 days of ice and cold retention. The top has a wide mouth roll-top to give you quick access. A high impact base lets you place the bag on any rough surface without damage. Other handy features include the front and back pockets, D-rings to make tying down easy, a daisy chain, and a removable carabiner that also doubles as a bottle opener. 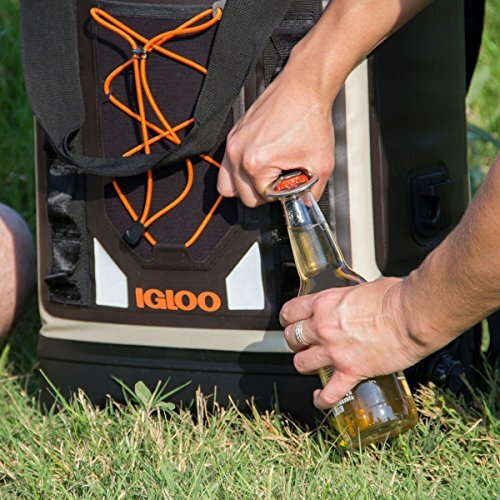 The Igloo Marine Ultra Backpack Cooler is another option. It resists leaks, stains, and odors, plus has non-corrosive hardware for trips on the salty ocean. The Coleman Backpack Cooler has a 28 can capacity, plus a large zippered front pocket to keep your dry goods and gear from getting soaked. A bungee cord on the front adds to its storage capabilities. The main compartment is BPA- and phthalate-free, plus is heat welded to reduce leaking. The liner is antimicrobial to resist nasty smells, fungus, mold, and mildew, plus makes it easy to clean this stylish backpack cooler. There is extra padding on both the back, waist, and shoulder straps for more comfort over long distances. 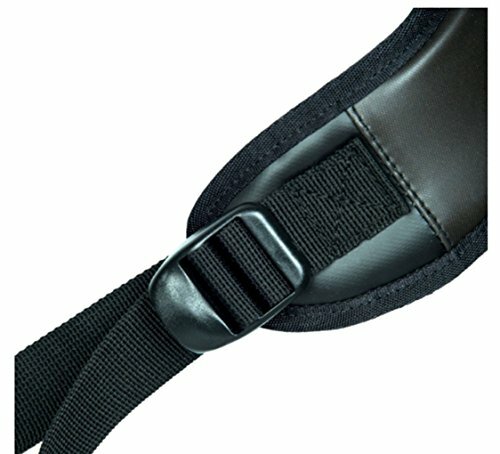 The straps are also adjustable and have a thick waist belt for extra support. 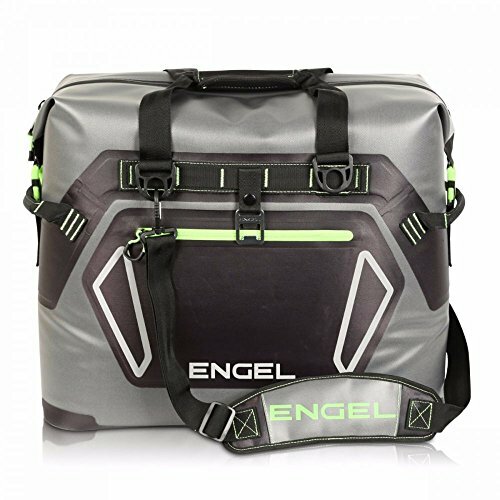 The Engel Backpack Cooler comes in a few different colors, all of which are made of durable TPE coated 500D polyester diamond ripstop that resists tears. Inside is an inch of closed-cell foam insulation for maximum ice retention. There is also a radiant barrier liner to block the sun’s rays from heating up your bag. It holds 24 cans, weighs 6 lbs, has multiple storage pockets for your dry gear, and a shoulder strap. The Engel Cooler Bag Backpack is another option, with the same capacity as the Engel Backpack Cooler. It lacks the shoulder strap but has added a large back pocket for tablets or iPads. Though less padded, the straps are vented, with Polyethylene foam insulation inside. 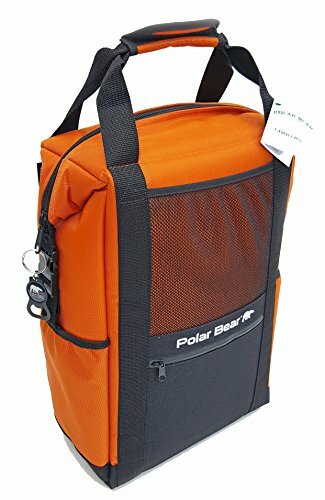 The Polar Bear Backpack Cooler is built to last through all types of rugged trips. It uses UV 840D TPE coated nylon for its shell, with high-density open cell foam insulation inside to keep that ice intact for a minimum of 24 hours, even in 100-degree heat or higher. The FDA food grade liner is both sweat and leak proof, plus is easy to clean. 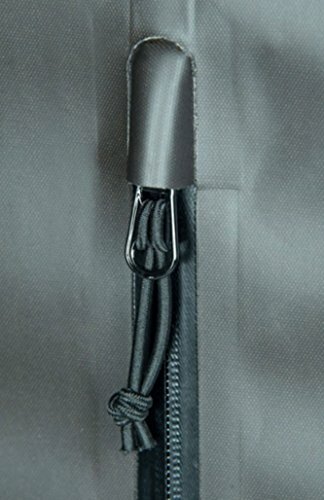 A heavy-duty, weatherized YKK #10 zipper closes the main compartment. Unlike some other brands, you can even customize this backpack cooler with your name or a company logo. 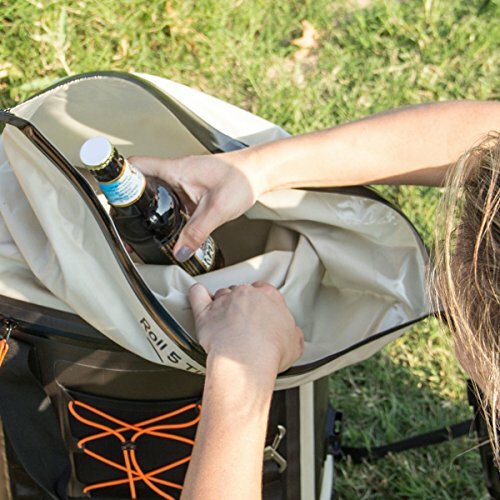 Other handy features include side release buckles, a Velcro wrap for the handle, a side pocket, and a pull-tap that doubles as a bottle opener. When you’re trying to decide which backpack cooler to buy, you first need to consider how much you will be carrying. For trips by yourself, you’ll only need a few cans or bottles of your chosen beverage, plus a bit of food to cover meals and snacks. If you’re traveling with another person, or the whole family, a bigger bag is obviously going to be necessary. But you don’t want to go bigger than you need. Too much empty space can actually increase the speed your ice melts, so bigger isn’t always better. Cooler backpacks can be used for almost anything. 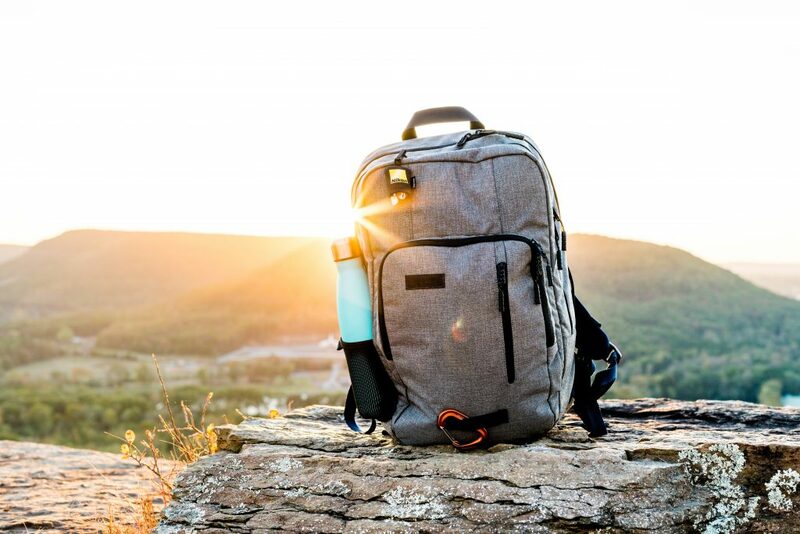 Outdoor trips like hunting, hiking, or camping will require food and water, or beer if you prefer it, plus the backpack will keep your hands free for other gear needed on these types of trips. Some backpacks are also designed for boating and fishing, with features that include waterproofing, leak-proof zippers, and even the ability to float. But you can even use your backpack cooler for more modern trips, like picnics in the park or to carry your ingestibles with you to school or work. Anywhere you need to go, a cooler backpack can go with you. Every backpack cooler has a large insulated main compartment, but some add a second smaller compartment to keep your food separate from the melting ice, or to hold an ice pack or two for some extra cooling power. Most cooler backpacks also have some other type of storage. This usually means a couple of pockets, including zippered, mesh, or slip pockets. These types of bags may also use bungee cords to hold larger items or daisy chains for attaching your gear. The more of these types of storage options, the better, to keep your hands free and limit the amount of stuff you need to carry by hand. There are a few things to consider when it comes to comfort. 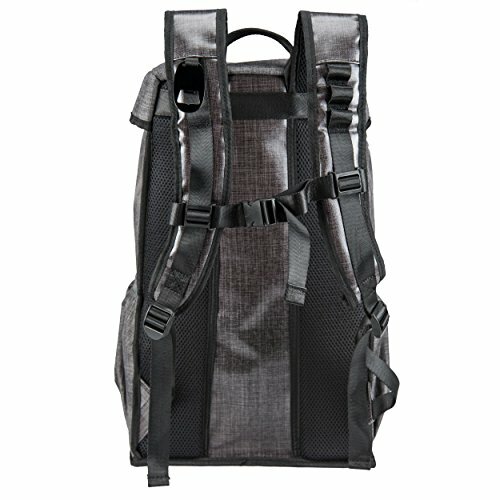 Since the backpack will be pressed up against your back the whole time you’re carrying it, the best option is to find one that is padded in this area. You also want to make sure the straps are padded as well to keep them from digging into your shoulders while you walk. Venting in both of these areas is also a good option to have, to reduce sweating and keep you cooler during even the shortest trips. Any straps should be adjustable so you can tighten the bag to you as much as needed to reduce shifting and throwing off your balance. This is also why having even weight distribution should be included in the features. As I said above, backpack straps should be padded and adjustable, plus vented if you can find it. But they aren’t the only straps you need on a decent backpack cooler. A sternum strap and a waist belt will give you more support, taking some of the pressure off your shoulders. Some cooler backpacks also include carry handles and shoulder straps. Though not necessary, these can be great for those times when you just need to move your bag across the room or when you’re trying to pack your car. They can also be helpful when you want to give your shoulders a break. Most cooler backpacks are made using durable materials like nylon or polyester. These two are sturdy, don’t tear easily, and last for years, even with rugged use. If you want to upgrade them, look for these with ripstop technology to keep any tears they may sustain from spreading. Other features that can increase the durability of your backpack are welded seams, which also help with waterproofing, a reinforced base to protect against rocks or other rough surfaces, and sturdy leak-proof zippers that won’t break at the slightest tug. Aside from all the necessary features mentioned above, there are a few that can make the bag even better. Some bags come with bottle openers for those who don’t like their beer in cans. A few bags also come with corkscrews for the wine crowd. There are also backpack coolers that add other handy items, like plates and utensils, and even cheese knives and a cutting board. Though these items won’t make or break the bag, they do save you the time of buying these items separately. The debate about the YETI Hopper Backflip vs RTIC Backpack Cooler has only just begun, and no doubt will rage for years between those who are loyal to their brands. Each model has its own advantages, making them great choices, though some of their features do top the other model in some areas. The YETI Backflip 24 is lightweight, with durable materials that resist water, mildew, punctures, and even UV rays. The shoulder straps are ergonomic, adjustable, and padded for your comfort. Plus the chest and waist straps are removable for added convenience. Though untested by the public, the performance of YETI’s other coolers pretty much guarantees this one will meet your ice retention needs. With its smaller capacity, this one is best used by those traveling alone or with a partner, for outdoor adventures like shore fishing, hunting, or climbing. The RTIC Backpack Cooler is a bit heavier at 6 lbs, but it also has the capacity to carry forty cans, double what the YETI model can hold. It replaces the zipper closure with a roll-top, sealing in the cold air while creating a perfect seal to help this bag float if it goes overboard. This one can also be rolled up when not in use, making a smaller storage package than almost any other type of backpack cooler, the YETI model included. Plus, it costs half of what the YETI Backflip 24 is priced at. For those on a budget, this is a better option. Plus, the capacity makes it perfect for groups of three or four, even for a couple of days. The floating capability also makes it an ideal choice for boaters, though anyone on land will love this cooler, too. 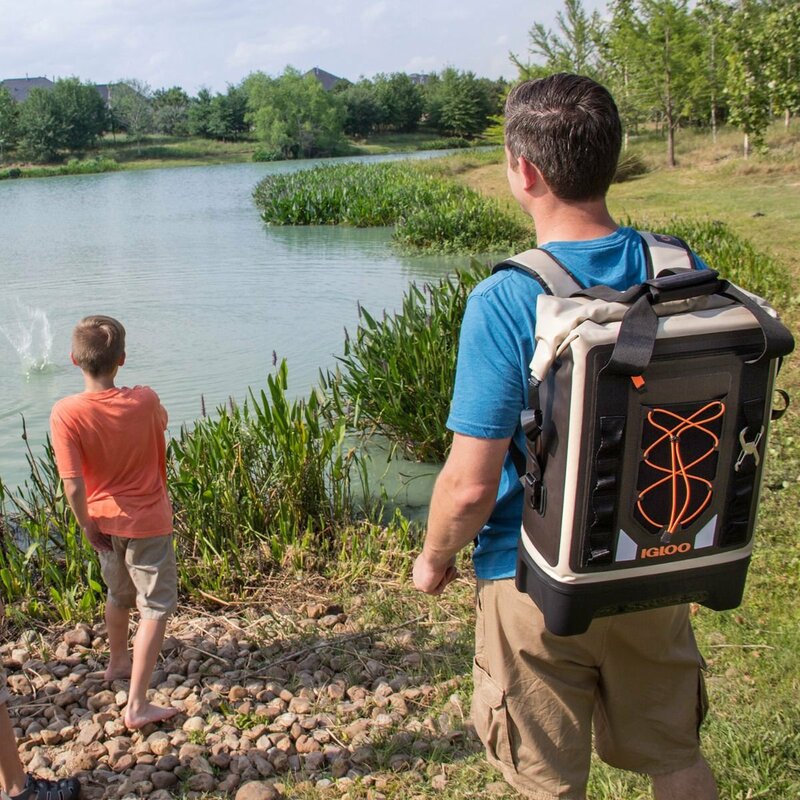 While you’re at it, be sure to check out our other guides on the best backpack coolers, the YETI cooler alternatives, and the top rated RTIC coolers (YETI’s biggest competitor).